In this analysis the distribution of dark matter in the form of a circular cone as depicted in Figure-2 was used to determine the rotation curve of star systems as they rotate around the Milky Way. Initially, a two-body analysis was conducted where the mass of the Milky Way was located in the central bulge of the galaxy. However, the results did not match the measured rotation curve for the galaxy. Because invisible matter forms a dark matter halo that extends well beyond the visible edge of the galaxy it was not surprising the two-body method failed to predict the actual rotation curve. Please see Figure-4 which compares the actual rotation curve for the Milky Way to results predicted by the much simpler two-body method. Because dark matter extends well beyond the visible edge of the galaxy the distribution of mass within the dark matter halo causes a flattening of the rotation curve not predicted by the standard two-body method. The MathCAD analysis presented below uses Newton's shell theorem to determine the combined effect of ordinary matter and dark matter on the rotation speed of stars as they orbit around the galaxy. 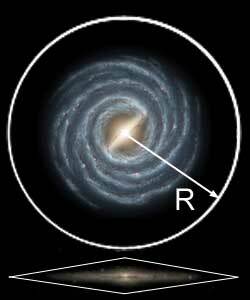 Specifically the theorem states that when a star system is at radius r from the center of the galaxy, the portion of the galaxy that lies outside the shell of radius r does not produce a net gravitational force on the star system. In addition, only the portion of the galaxy that is inside a shell of radius r produces a net gravitational force on the star system and that mass is located at the center of the galaxy. Figure-3 presents the results of the analysis to determine the rotation curve of the Milky Way galaxy compared to the rotation curve using a two-body method. Finally, the rotation curve of the solar system is determined using the two-body method and the results are compared to actual planetary orbital speeds. These analyses clearly illustrate that a disk of matter that forms the Milky Way galaxy produces a flattened rotation curve that matches measured orbital speeds of stars that orbit the galaxy.